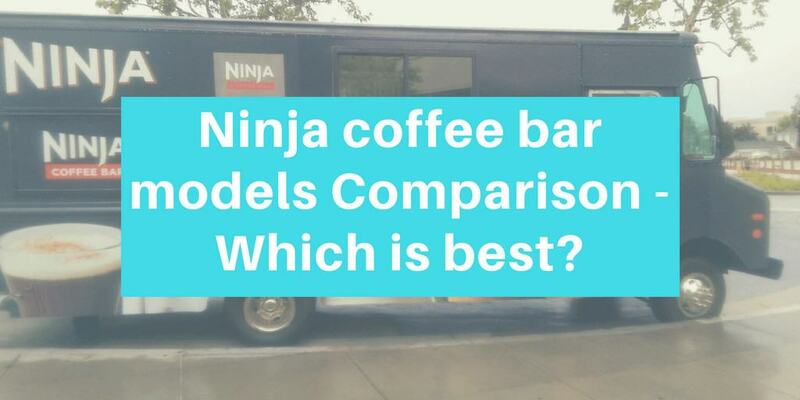 Finding the right machine to give you the perfect cup of coffee can be challenging, but that's what makes machines like the Ninja coffee bar so great. 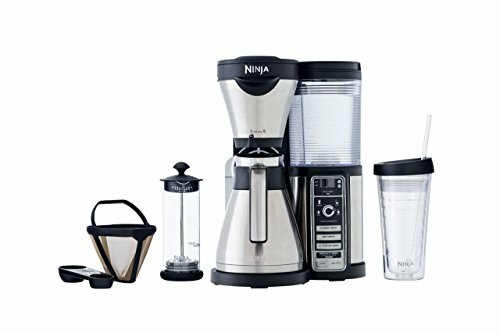 This Ninja coffee bar reviews will give you a comparison so that you can choose the best model for your lifestyle. 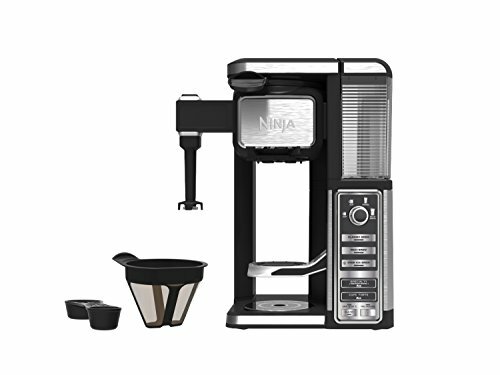 This machine is one of the simpler coffee makers from Ninja. In essence, it is a drip coffee machine, but it also includes some extra features that you wouldn’t find on a regular coffee machine. 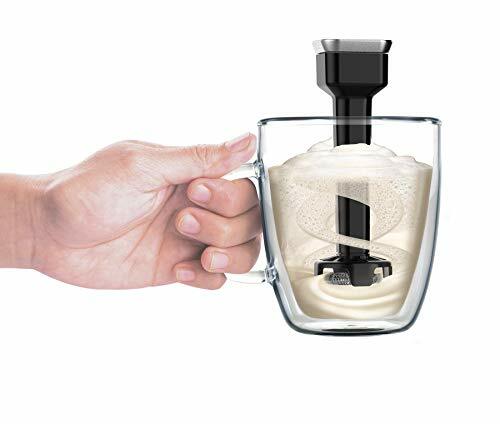 It measures 14.8” x 10.5” x 11.7”, weighs 7lbs and is supplied with a glass carafe. It can make four different sizes of coffee, from single cup to carafe, and also allows you to choose the brew strength, giving you the choice of “classic brew” or “rich brew”. 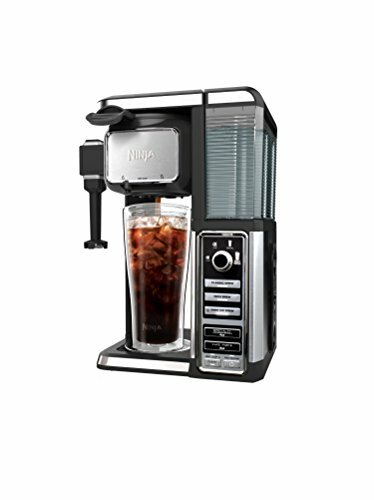 It also offers the option to make iced coffee, something you won’t find on a regular drip coffee machine. The control panel is simple and easy to operate, and the machine is equipped with “Auto iQ One-Touch Intelligence” – this is a fancy way of saying it measures the correct amount of water for the size and strength you choose. However, it does take the guesswork out of dosing. We liked the programmable feature that allows you to set the machine to come on at a predesignated time, allowing you to have coffee brewed and waiting when your alarm sounds. Perhaps the most important question is whether the machine makes good coffee – and the answer is, yes it does! This is a great option for someone who wants a simple coffee making system that allows you to brew great coffee in varying sizes with a minimum of effort. This machine, sold as the “next generation Ninja”, is a step up from the CF021 and offers a whole range of extra features. It gives you much more control over the coffee you make and versatility to produce different styles of brew. It measures 15” x 11.34” x 16.34” and weighs 12.7lbs. This brewer is capable of producing six different sizes of coffee. The smallest it can brew is a single cup, which it does without the use of a pod, meaning you can make individual portions of coffee simply using regular grounds. One particular advantage is the in-built frothing wand, which allows you to create any number of coffee shop-style drinks. This is a great machine for someone who enjoys drinking different types of coffee and who wants a machine that allows them to experiment. This machine measures 12.2” x 11” x 16.3” and weighs 12.6lbs. It can make four sizes of drink, cup, XL cup, travel mug and Multi-Server, and is capable of brewing five different styles, “classic”, “rich”, “over ice”, “specialty”, and “Café Forte”. Note that there is no carafe option. The operation is simple using the easy-to-understand controls, and this machine will allow you to brew delicious-tasting regular drip coffee or – by using the in-built frother – to create all your favorite coffee shop-style drinks like cappuccinos, lattes and macchiatos. It features the same Auto iQ One-Touch Intelligence common to all Ninja machines to ensure your brew is poured to exactly the strength you desire. This machine is supplied with only the filter and the dosing spoon – it doesn’t include the Hot & Cold Multi-Server tumbler, which must be bought separately. 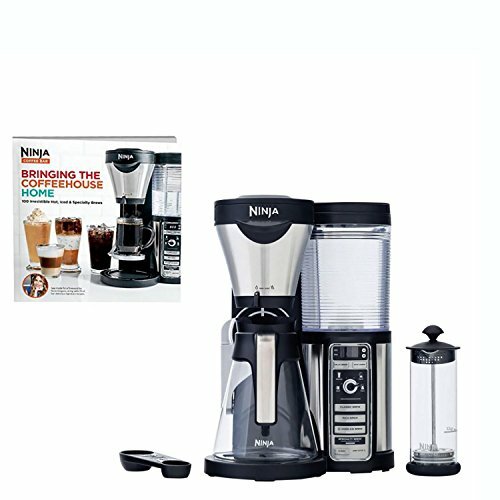 This is the ideal unit for someone who wants to make a variety of coffee drinks – you can buy the extra accessories later. This coffee maker is essentially exactly the same as the previous model, the CF111. It has the same dimensions and all the same capabilities. This means it can brew in four different sizes, from cup to Multi Server and can make coffee in five different styles, including “Café Forte” and “over ice”. It features the same Auto iQ One-Touch Intelligence technology to make sure your coffee is brewed to your specifications every time and also includes the in-built frother to allow you to create your favorite coffee shop-style drinks. The big difference here is that this model includes the special Hot & Cold Multi-Serve tumbler, allowing you to pour yourself hot and cold coffees of the largest size into a specially-designed receptacle. A great option if you already know you will want the tumbler. This is an upgraded version of a simple drip coffee machine that allows you to make a variety of coffee drinks by virtue of several adjustable parameters as well as the accessories it is supplied with. It measures 10.75” x 10.5” x 14.88” and weighs 8.2lbs. 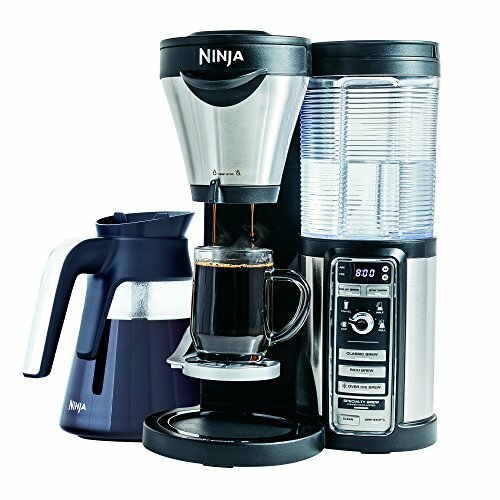 The CF080Z includes many of the features you would expect to find on a Ninja, including the ability to brew different amounts of coffee with different strengths. 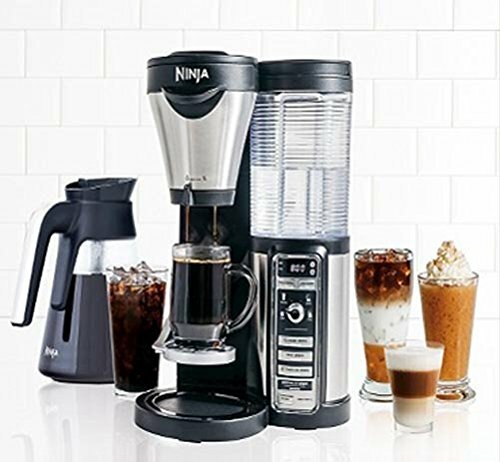 This unit allows you to brew a cup, travel mug, half-carafe or full carafe as “classic”, “rich”, “specialty” or “over ice” coffee. 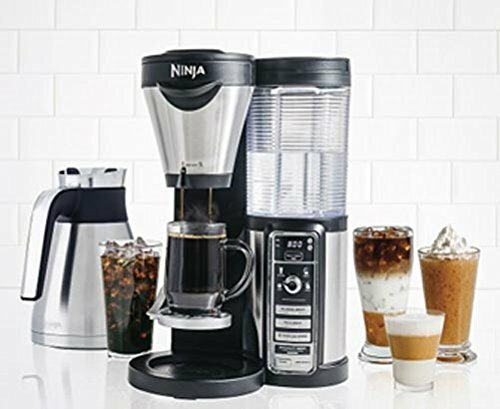 It also boasts the Auto iQ One-Touch Intelligence technology and Thermal Flavor Extraction system for superior-tasting coffee common to all Ninja machines. It is supplied with a glass carafe, which is kept hot on the intelligent hotplate, an 18oz tumbler and a separate frother. Great for someone who wants the freedom to make different styles of coffee in varying quantities. This machine is identical to the CF080Z in all ways apart from the accessories it is supplied with. This means it has the same capabilities with regards to brew size and brew strength. It produces superior-tasting coffee using Thermal Flavor Extraction technology to control the temperature, pre-infuse the coffee and ensure complete saturation and even extraction. It is supplied with the same glass carafe as the CF080Z, which it keeps hot on the intelligent hotplate for up to two hours. So what’s the difference between this machine and the CF080Z? It’s very simple – this model doesn’t include the tumbler. If you don’t think you need it, you can save yourself a few dollars by choosing this version instead. The CF081 is a slightly upgraded version of the CF080W and CF080Z machines. It is the newer version, but the differences are minimal. It has all the same specs and capabilities as the previous two machines. This machine makes great coffee and gives you flexibility to brew many different styles of coffee. It comes with a book of 40 coffee recipes to inspire your creativity. This machine is not supplied with a thermal tumbler. A good pick if you like the capabilities of these machines but don’t require the specially-designed tumbler. This model is the same coffee maker as the CF081. As with the CF081, it is supplied with a glass carafe and can make four different sizes of coffee, single cup, travel mug, half-carafe and full carafe. It can make the same four different strengths of coffee and use the same Auto iQ One-Touch technology to ensure optimum brewing for the type and volume of coffee you have chosen. The only difference between these two machines is that this version comes with an insulated tumbler suitable for hot and cold coffee drinks whereas the CF081 doesn’t. If you want the tumbler, you should go for the CF082 – but if you buy the CF081, you can always buy the tumbler later. The CF085Z is again very similar to the previous four machines we have reviewed, but with one significant upgrade. That is, it comes with a thermal carafe rather than a glass carafe, which promises to keep your coffee hot and fresh for up to two hours. What is the difference between a glass carafe and a thermal carafe? The answer is how it keeps coffee hot. A glass carafe relies on the heat from a hotplate to keep your coffee warm. However, with regular coffee makers, after only around 15 minutes, the coffee begins to stew. Even though Ninja have “intelligent hotplates”, the fact of sitting on a source of heat for long periods will eventually cause the coffee to become bitter and unpleasant. With a thermal carafe, this won’t happen since it doesn’t rely on a heat source to keep the coffee hot; rather, it keeps the coffee hot by insulation. The result is that the coffee stays hot for up to two hours – but it also remains much fresher than coffee that has been sitting on a hotplate. Other than this one addition, the machine is the same as the others we have just looked at. This is the perfect machine for someone who likes to make up a carafe of coffee and then drink it slowly throughout the morning – with a thermal carafe, it will remain fresh for the whole time. This is another very similar machine to the CF085Z. It has all the same capabilities and comes with the same attractive and effective thermal carafe that can keep your coffee warm for up to two hours without the need for a hotplate. It features all the same technology as comparable machines, including Auto iQ One-Touch and Thermal Flavor Extraction. 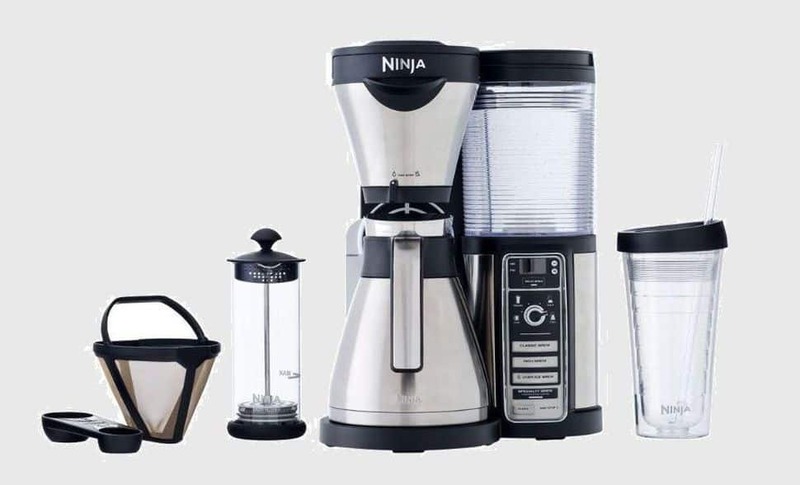 Like all Ninja machines in this range, it is capable of producing excellent coffee and is suitable for those hoping to make individual servings of coffee or coffee for larger numbers of people. The differences between this and the previously reviewed model are almost negligible. Make sure you pay attention to the accessories that are bundled with it since this is the only difference. The final machine in this range yet again has very little to distinguish it from other similar models. 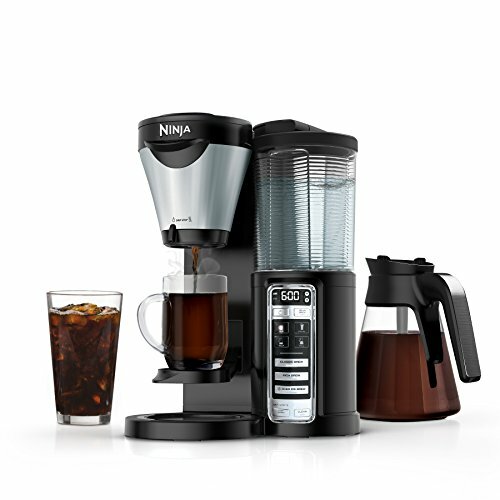 Again, this is a brewing system that is supplied with a thermal carafe – meaning you won’t need to use a hot plate and won’t need to drink bitter, stewed coffee. It is supplied with a milk frother for making coffee shop-style drinks like lattes and macchiatos; it also comes with a thermal tumbler to keep your hot coffee hot or your cold coffee cold. As with the previous model, the differences between this and other comparable models are practically negligible – you can safely buy whichever you find for the lowest price but be careful to pay attention to the minor accessories listed since there may be some small variation. You only need to press one or two buttons on the clearly laid-out control panel to start the brew cycle. Ninja brewers allow you to choose the size of your drink and the strength, again, without any complicated manipulation. However fancy a coffee machine is, it’s no good if the coffee it produces is poor. You have nothing to worry about here since one of the strong points of Ninja machines is that they brew great-tasting coffee. As you will see from the reviews, one very confusing aspect about the Ninja brand is that they produce machines carrying different code numbers – but that are identical in almost every way. 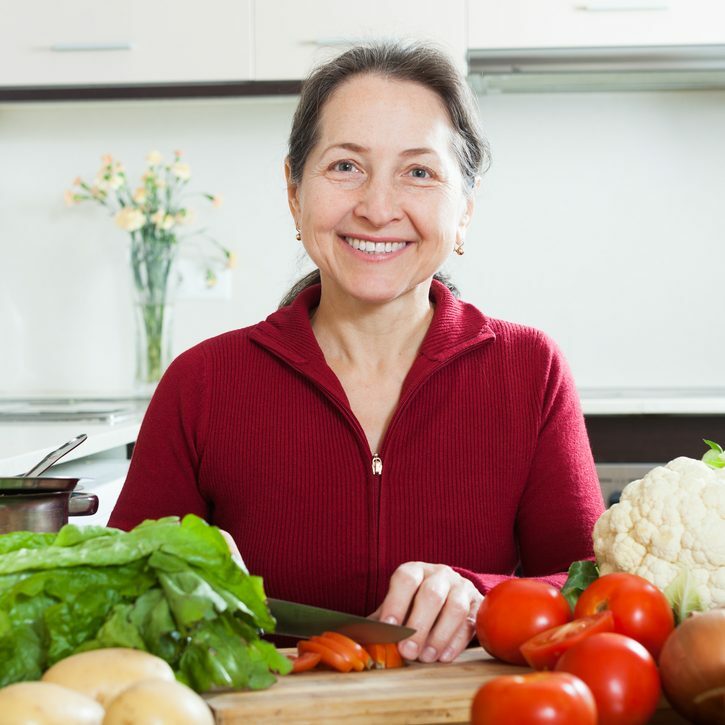 Often, this will be due to the inclusion of one extra accessory or one accessory being slightly different (a glass carafe or a thermal one, for example). However, in other cases, the difference is so small as to be practically negligible (the difference between one very minor accessory). We have highlighted this in the reviews, and our advice when buying one is either to pay very careful attention to the different accessories listed – or simply to treat these models as being essentially the same and then simply finding the best deal. The differences are sometimes really that minor! 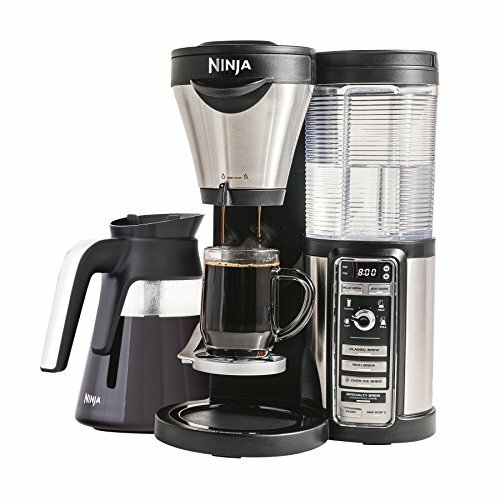 From this list, the Ninja Coffee Bar system CF091 is my favorite. 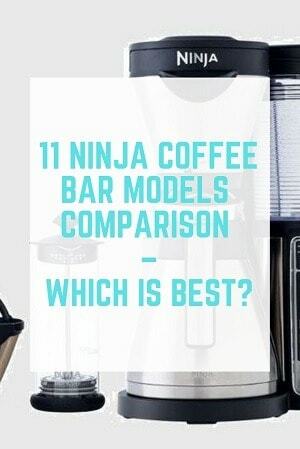 While some Ninja machines are quite different, others resemble one another very closely – however, we find that all brewers made by this company are reliable machines that without any exceptions produce great coffee. 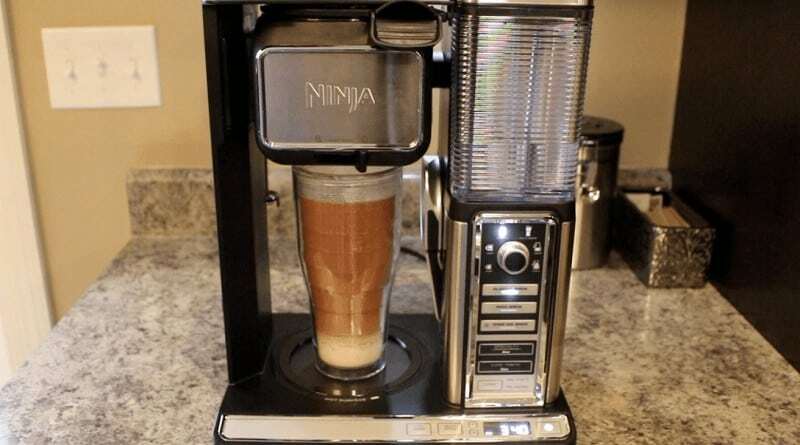 For this reason, we have no hesitation in recommending Ninja brewers to all coffee lovers who value simplicity and versatility – as well as a fantastic brew.